Operation Sophia’s mandate was due to expire on Sunday but should now continue for another six months with the same aim of deterring people smugglers in the Mediterranean. But it will no longer deploy ships, instead relying on air patrols and closer coordination with Libya, the diplomats said. Rome called for other countries to open up their ports instead, but no other EU states came forward. Diplomats said countries including Spain, France and Germany signalled they were not willing to host more rescued people – most of whom are fleeing wars and poverty in Africa and the Middle East. I take note of the decision taken by the EU’s Political and Security Committee with regards to Operation Sophia. I regret that this will lead to even fewer naval assets in the Mediterranean, which could assist the rescue of persons in distress at sea. Lives are continuing to be lost in the Mediterranean. 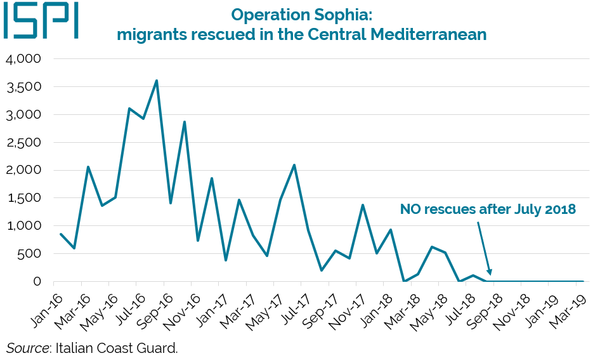 This should remind states of the urgency to adopt a different approach, one that should ensure a sufficiently resourced and fully operational system for saving human lives at sea and to safeguard rescued migrants’ dignity. Today’s decision was adopted by the Council by written procedure.